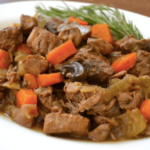 This recipe is a great way to use any left over meat and veggies. In addition the vegetables listed in the recipe, you can substitute over favorites like cauliflower, green beans, sweet potato, rutabaga, and radishes. Easy preparation too, assemble the ingredient in your slow cooker and your down... well.. 6-8 hours later.